Why have one boat when you can have two? Fate recently brought us a wonderful bit of good luck. I was showing my friend Ed the boat when he mentioned that there was another Shark 24 for sale in James Bay that we might want to look at. Manuel and I were torn on the idea; sometimes ignorance is bliss. 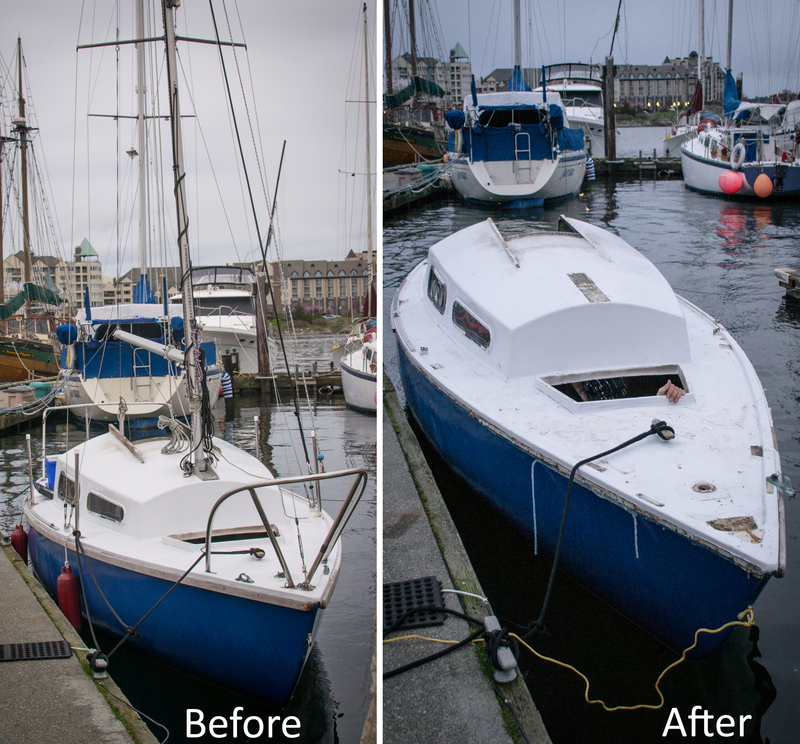 What if we found out the boat was a better deal and were struck with buyer’s remorse? Would we abandon the boat we’d already poured so much energy into for a younger, perkier model? Luckily, she turned out to be not so perky. Curiosity got the best of Manuel. He went to have a look and learned the boat’s story in the process. Rather than a vibrant young woman he found an aged ex-model whose former glory had been stolen by years of smoking, resulting in an estranged husband and a tracheal tube. Somehow there had been a fire. It sounds like a flare was the culprit. 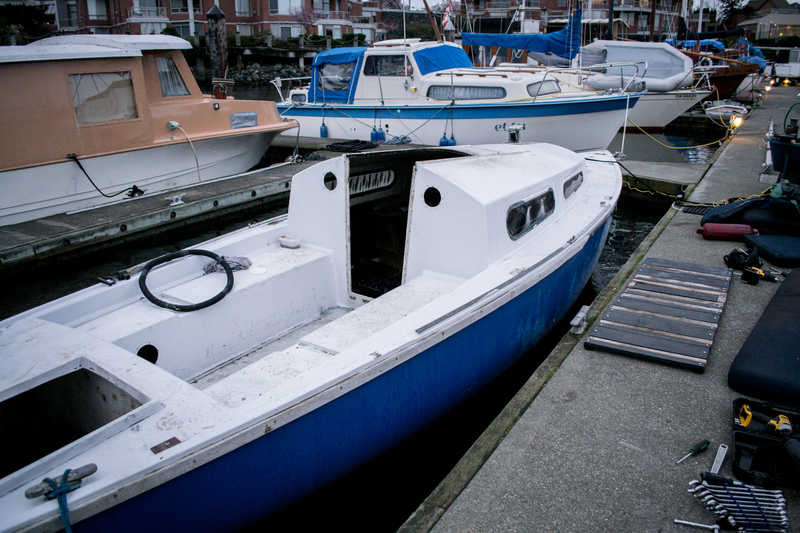 The boat’s former owner had tried to sell her but what fools want to buy a smoke damaged boat? (I can think of three…). Fed up and disillusioned, the man left the country, abandoning the boat. Now it was the marina’s problem. A problem that they were eager to see disappear. They offered to just give us the boat, but what the hell do we do with two boats? 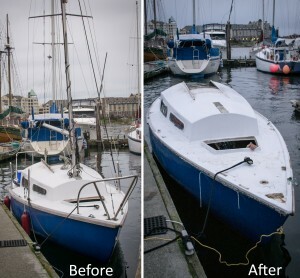 The thought occurred to us to strip it down and then have an unfortunate “accident” send her to the bottom, but me being both an environmentalist and an employee of the agency responsible for the safe navigation of Canadian waters, I thought that option not in my best professional interest. Eventually we agreed to pay a small sum of money to strip the hull of anything we wanted. To us, this would mean everything. 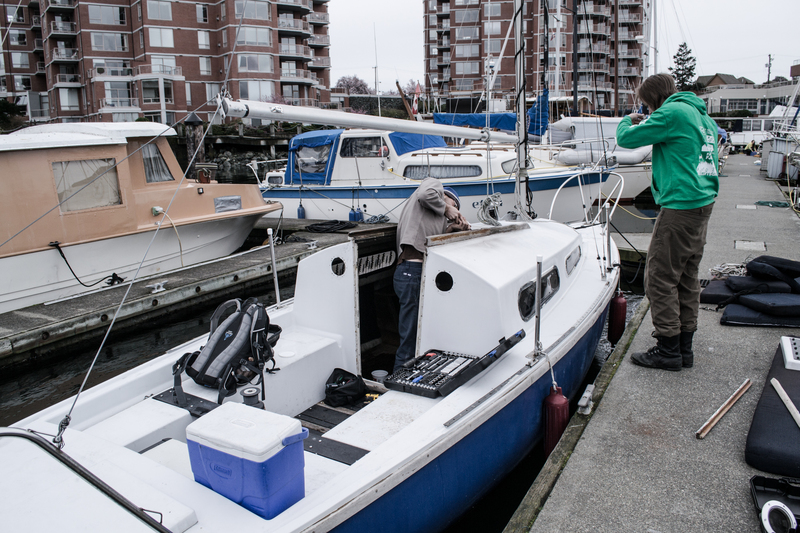 On an overcast Sunday afternoon in winter we met a French-Canadian down at the docks to exchange goods. All the essential elements of a shady deal were there. Manuel, Kris, and I then spent the next four hours stripping the boat of anything of value. We had now entered the marine chop-shop business, and I dare say we were good. Like Magpies, we were especially attracted to anything shiny. We’ve learned that stainless steel items, even just screws, are pricey. So is teak. We spent a lot of energy removing as much of the wood as possible. While we were working away a guy came along who told us that he used to own the boat (prior to the estranged husband). People bond with boats. A romantic way of looking at it is that this bond forms over years of joyful memories. The reality is probably more like an old marriage where so much time, money, and energy has been spent on the other party that you’re left with a confusing mix of love and hate that you can’t imagine your life without. As he watched us ruthlessly dismantle his former vessel like a pack of Jawas from Star Wars, I wouldn’t be surprised if a tear rolled down this man’s cheek. He didn’t look happy. The next day my wrists were sore from the amount of unscrewing and ratcheting I did, but by the time it got dark the boat was nothing but a hulk. It was like the Grinch had been there on Christmas night. Partially we were sad about what had become of this boat. It seemed to have rotten luck and it had finally met its very inglorious end. Kris made a good point though: it was like an organ donor. Its sacrifice meant that our boat could sail on. We now have a rudder for our boat and, equally exciting, an entire second mast. The top pulley for the main halyard on ours is jammed, meaning we couldn’t hoist the mainsail. Our shrouds and stays are worn out and could break under strain. All these problems were now fixed thanks to our new mast, there’s just one problem: how do we move it? 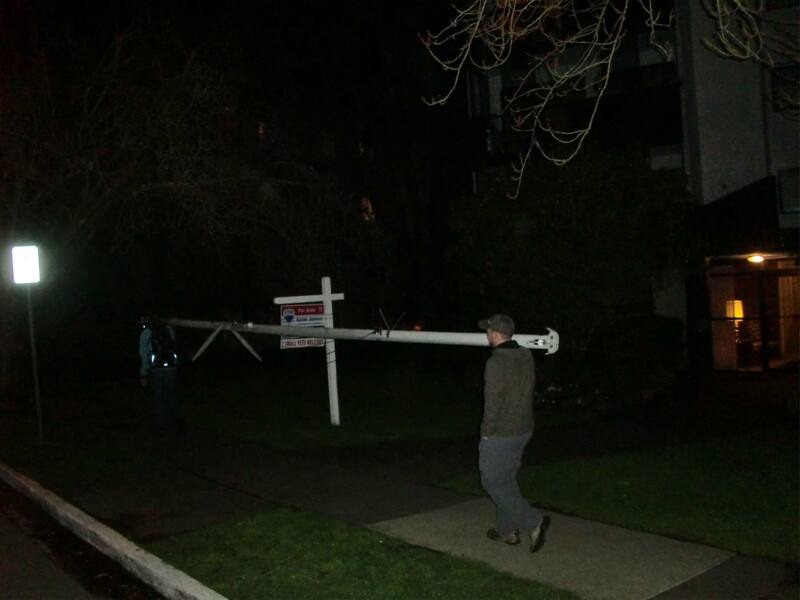 Getting it down was easy enough but strapping a 24 foot mast to the top of my VW Golf was anything but realistic. It would have to be carried. 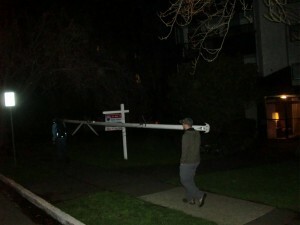 It took Manuel and I an hour to walk the mast from James Bay to its temporary home at Manuel’s. The journey was filled with strange looks and the occasional comment from passersby, the most common one being “that’s not something you see every day.” Half way along Kris delivered us some donuts, which for me was dinner and for Manuel was both lunch and dinner. I ate four in a row, Manuel had five, and I think neither of us is ashamed. It was a long day! Well Kyle. Your one funny little family member. Thanks for the laughs. Keep them coming. I have sent your blog to friends for a laugh because I have a feeling this story may go on for awhile. Very funny! But, this could work! There’s nothing wrong with magpies unless the previous owner is watching you lol.